Book a stay at Courtyard Atlanta Downtown and discover the vibe, history and culture this city has to offer. 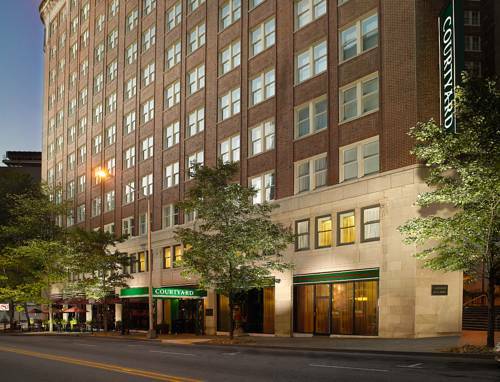 We are located in the historic Carnegie Building and feature easy access to popular attractions including the World of Coca-Cola, Georgia Aquarium, Philips Arena and Centennial Park. When not exploring the area, relax in our sophisticated accommodations boasting stylish decor, complimentary Wi-Fi and luxurious bedding. Start your day with breakfast from The Bistro - Eat. Drink. Connect. and pair it with your favorite coffee from Starbucks , then join us later for lunch or dinner with cocktails in an inviting atmosphere. If your visit is business related, we offer three meeting rooms featuring AV equipment, high-speed internet and delightful catering options for an outstanding event. After a long day, release the stress in our fitness center equipped with cardiovascular machines and medicine balls. Book your upcoming getaway today and experience the best of Downtown Atlanta in style. Our downtown Atlanta hotel is your food and beverage destination for refreshing breakfast and a variety of dinner and cocktail options. The Bistro also offers specialty beverages made with Starbucks coffee to help you get a jump on the day. - Metro Tour Shuttle Inc.